September, seductive winter light is coming on, beaches are covered deep in sand pushed ashore over the summer, making access easier. Not the high season for litter usually. Local fisherman have been plying the Marin coastline for months looking for crab, salmon, halibut and rockfish. I can tell when they have been out. Beaches are covered in beer and soda cans, bait packaging, miles of plastic rope, hundreds of buoys and bait containers, snack wrappers and sometimes fishing poles or parts of boats. All blown or carelessly tossed overboard, then blown to shore. I pick it all up and pack it out on my back. 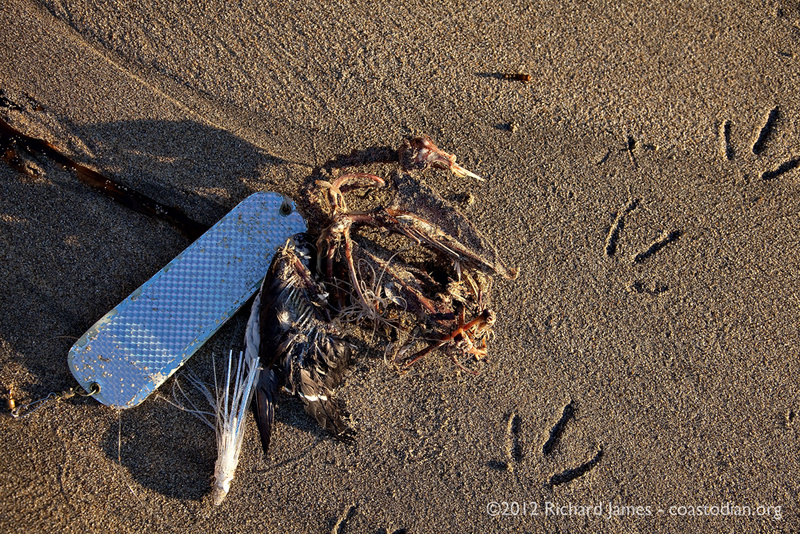 This evening a shiny flasher caught my eye in the wrack, I bent down to untangle it from the surf grass and other kelp. A long strand of mono-filament was threaded into the plants, a plastic hoochie, more line, a copper spring of some sort. Then I spied the scavenged body of a seabird, a murre or guillemot with a large nest of the mono-filament tangled around what was left of the wings and sternum. NOTE: According to a bird expert I know, the bird is a common murre. Had the bird seen a fish on the hook, swallowed it and died? Or had it surfaced and become tangled up in the line after diving perhaps 200 feet deep in search of a meal? I did not know. I only know that it was alive before coming into contact with this man-made trash, and now it was dead, wrapped in plastic. Egg to bird to egg to bird and so on. Nothing in that cycle is toxic. All of it breaks down into something another creature uses for life. Humans on the other hand have created all manner of clever tools. Tools made of plastic, which comes from oil. Plastic clothing, plastic fishing gear, plastic boats, plastic food wrappers. All of it so convenient for humans, for a moment that is. Once we are done with our “single-use” item, we generally toss it overboard, or into the land-fill, or the street, or out the window as we drive down the freeway. None of this plastic breaks down or goes away or turns into something humans can eat. What other creatures celebrate milestones in their life by releasing balloons into the air? Balloons made of nylon or latex that will fall back to earth eventually. Balloons that look like jellyfish and other forms of food to sea-life. Have a look here at the hundreds of images of balloons I found at the beach and in the High Sierra Nevada. We are poisoning our nest, the nest of all the creatures on this planet, with our human conveniences. Can we survive without so much plastic in our lives? We survived until 1907 without any synthetic plastic. About 300 million tons of plastic is produced globally each year. Only about 10 percent of that is recycled. Of the plastic that is simply trashed, an estimated seven million tons ends up in the sea each year. There, it breaks down into smaller and smaller fragments over the years. 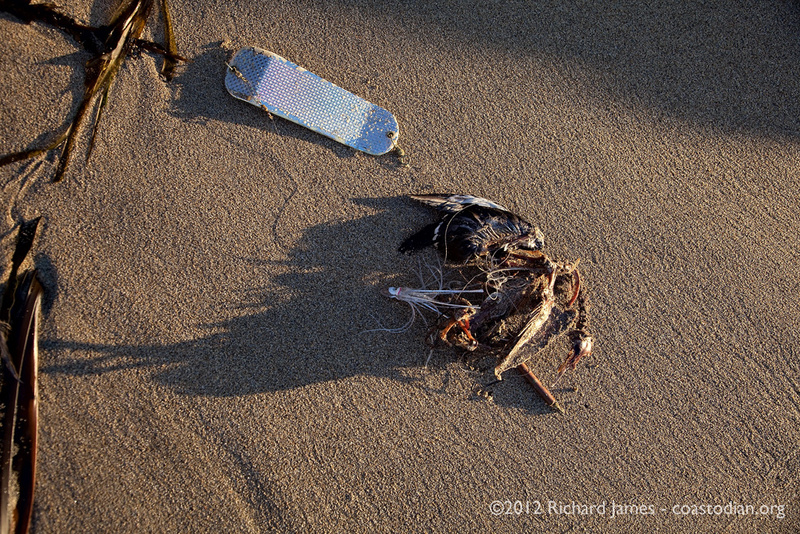 The tinier the pieces, the more easily they are swallowed by marine life. 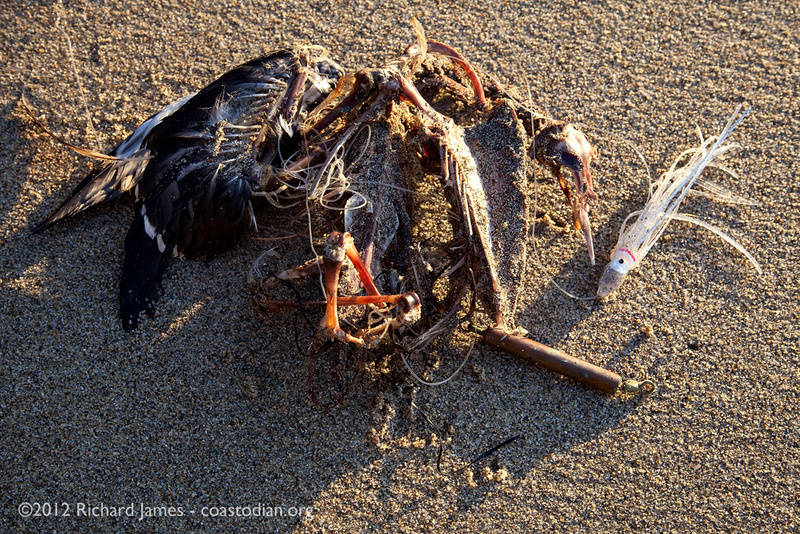 (One study found that fish in the North Pacific ingest as much as 24,000 tons of plastic debris a year).